Indirect services requires no formal training. Just a desire to be involved either on a regular basis or at special times during the year. Donation Center: Assistance with receiving, separating, and organizing donations at the Donation Center. We provide emergency clothing to our clients, so this center and the volunteers are a valuable asset to the clients we serve. Presentations to the public Assisting staff in presenting community education programs throughout Amador County. This may involve presentations at other agencies, organizations, schools, booths at fairs, etc. We even have a puppet show! Clerical support Clerical assistance in the office, answering phones, copying documents, organizing supplies, computer work. Fund raisers Creative people with great ideas for fun, successful fund raisers are needed throughout the year. Our agency depends on these funds and we are always looking for fresh ideas! Community Promotions Holiday assistance for our safe house clients. We often provide food and gifts to make their holidays as normal as possible during a difficult time in their lives. Awareness Campaigns We have two annual awareness campaigns that we need help with, planning and organizing each year. You may have seen our “purple people” throughout the county, representing our Domestic Violence Awareness Campaign in October. Our display at the County Library in Jackson represents our Sexual Assault Awareness Campaign in April. Direct Client Services requires our volunteers to obtain certification . We offer the 80 hour training as needed, free of charge for volunteers. A valid drivers license is required as well, with a good driving record. Victim Assistance Providing assistance to victims of domestic violence and sexual assault who need counseling services , information and referrals, client follow up and accompaniment to social service agencies as support. Providing on scene support at hospitals and providing crisis intervention and emergency assistance. Court Advocates Providing court related assistance to victims. This may include assisting victims with Temporary Restraining Orders, accompanying clients to court as support. Safe House Volunteers Providing support and transportation in Operation Care’s van to safe house residents. Main-training house rules and counseling. Crisis Line Volunteers Providing crisis intervention to clients victims/survivors of domestic violence, sexual assault and other crises) on the 24 hour help lines. Volunteering to help with our annual Domestic Violence or Sexual Assault Awareness Months, or helping with a fundraiser or event, by distributing flyers or awareness materials, organizing the event, setting up a booth, helping to decorate, assisting with a fundraising our yard sale, talent show, or one of our fun run events. Click HERE for information about serving on our Board of Directors. 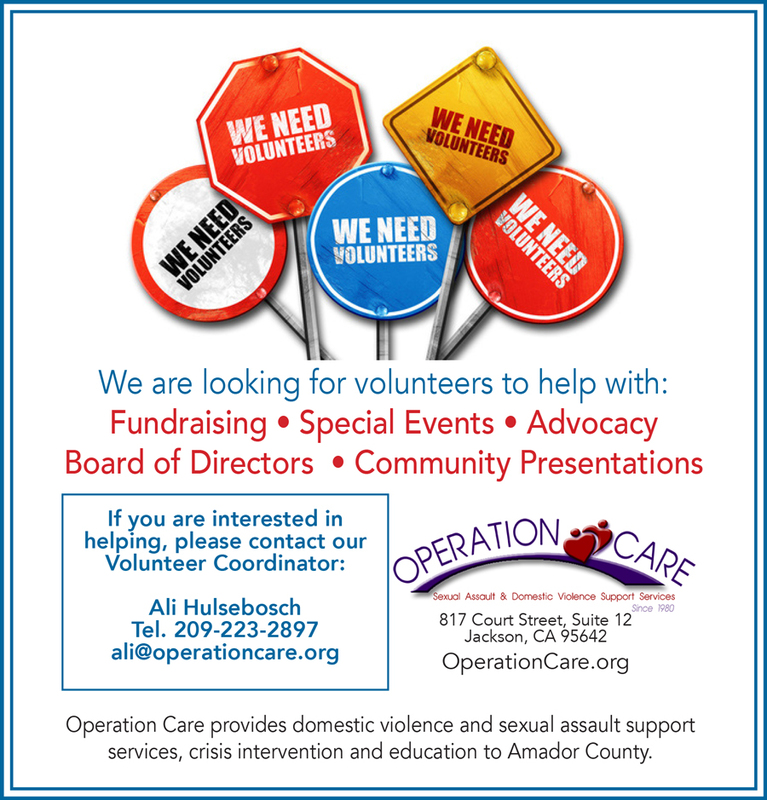 The volunteer opportunities at Operation Care are numerous – if you are interested, contact Ali via email at ali@operationcare.org or by phone at (209) 223-2897.